Our Sri Lanka travels continue and yesterday we made our way, by seaplane again, from Ceylon Tea Trails to Cape Weligama. I wouldn't normally be one to get excited about two seaplane journeys in one trip, but we ended up having the same pilots with Cinnamon Air and they took us on the most scenic route as we headed for the coast. 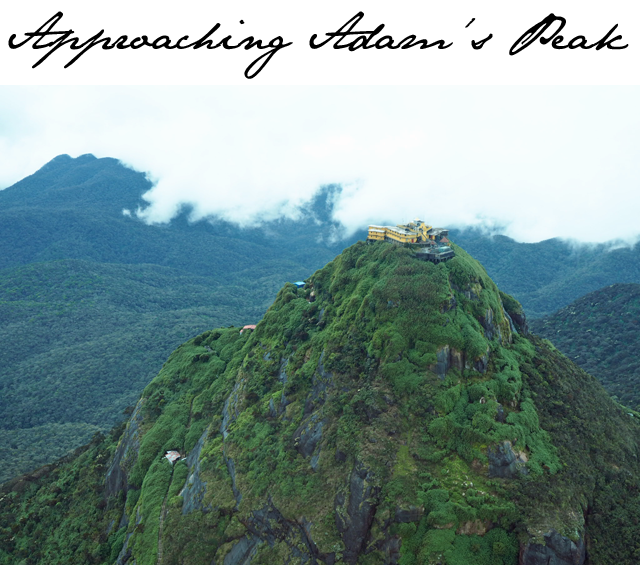 One of my main regrets, while staying at Ceylon Tea Trails, was not having the time to visit Adam's Peak. For those of you unfamiliar with this spiritual landmark, allow me to quickly paraphrase it's importance. 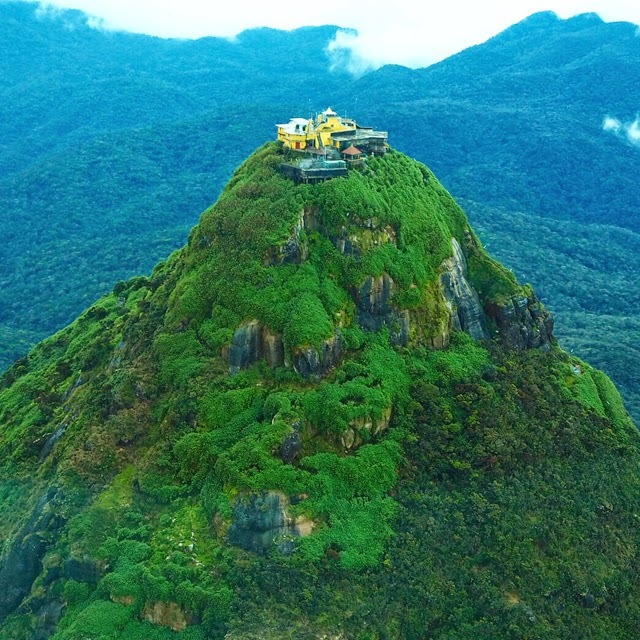 Millions of people each year come to Sri Lanka on a pilgrimage to the top of Adam's Peak. They climb thousands of steps to reach the top where the find the footprint of Adam, for Christians that is. It is said this was where he first stepped onto the earth after being cast out of paradise, hence the name "Adam's Peak." However, this is a pilgrimage made by Hindus and Buddhists as well, as they too believe that the footstep in the stone represents that of Siva, for Hindus, and Buddha, for Buddhists. It is a journey made by believers and the curious alike, and is a scene like nothing you have ever witnessed before. People begin their journeys as early as 1am so as to reach the peak on time to watch the sunrise. As you climb and look down, in peak season, you will see the stairs and land stretching out before you covered with tiny lights as people follow in your footsteps to the top. One can certainly easily understand how this would be a spiritual moment in time. Now before you think I've just gone on a wild and crazy tangent here, there is a reason I mention all of this. 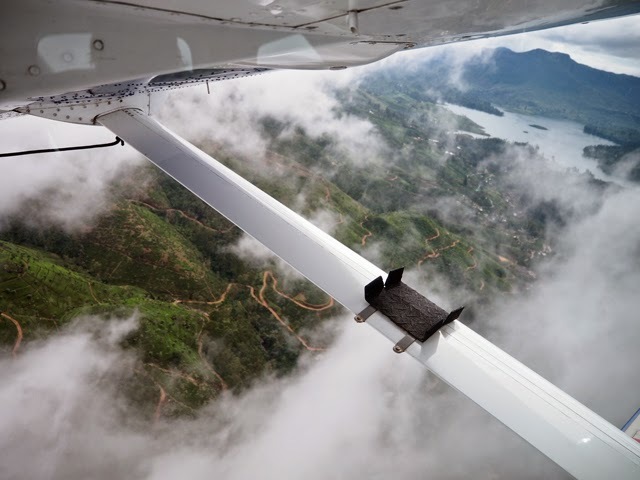 As I was taking off in the seaplane it weighed heavily on me that I had not done this trek while I had the chance, but I was even more upset that I had not at least made the car journey to visit the base of the peak and to see the people climbing to the top. While I should hope that I'd be returning to Sri Lanka in a matter of months, I never know what the future holds and Adam's Peak is not to be missed when given the chance to visit. Essentially, here I'm telling you to make it a "must" on any itinerary you put together if you book into Ceylon Tea Trails. Now, back to that whole seaplane with Cinnamon Air. 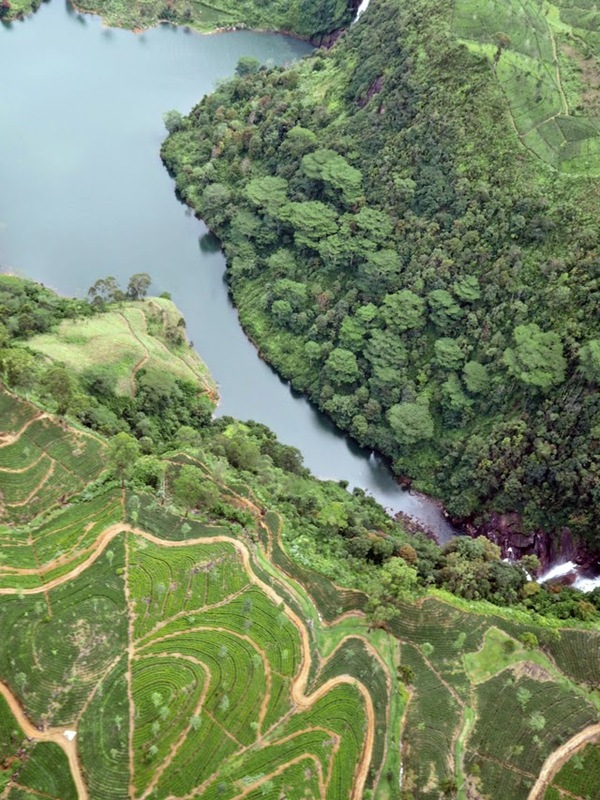 As we made our way off the lake and into the sky the pilot told us to have our cameras ready as our route to Cape Weligama would be a memorable one. So, I reached down for the Olympus Pen and had it strategically placed on the window's ledge so as not to catch too much glare. 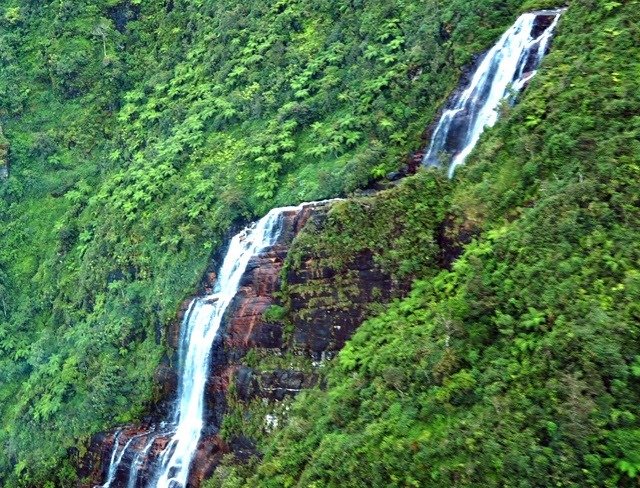 We flew over waterfalls, beautiful hills covered from top to bottom in tea plants, and bright and vibrant villages as we climbed into the sky. Then the pilot pointed ahead and said "Adam's Peak." As I'm a total dweeb, I dropped my camera in excitement. Nothing can prepare you for the sight of the peak as you approach. It is, in short, magical. Luckily, I got myself back together in time to shoot a few pictures, which I will reference regularly until the day I can return and climb with the millions of others that do so each year. For those of you making the journey, start training now. Apparently it is a rigorous walk that is described by many to be "intense" and unexpected as the stairs seem to stretch on forever - 7km to be exact. It would seem, however, that popular believe is "no pain, no gain." And for what I have read, it is a feeling like none other when you reach the top. Sri Lanka and Ceylon Tea Trails, I'll be back for more, without a shadow of a doubt, and I will climb Adam's Peak. Fashion Foie Gras is a guest of Cape Weligama and Ceylon Tea Trails. All Pictures taken with an Olympus Pen Camera. FFG is a UK ambassador for the brand.